Department of Civil & Geomatics Engineering, Kathmandu University (KU), in joint collaboration with Hydro tunneling & Research Pvt. Ltd., Nepal, Seoul National University (SNU). Korea and Norwegian University of Science and Technology (NTNU), Norway. has received a research grant from Energize Nepal. The project aims to improve the capacity of research and education required for development of the renewable energy sector in Nepal and the region. The title of funded project is Technical Investigation of Tunnel Support Technology in Hydropower Projects Located in the Himalayan Region of Nepal. 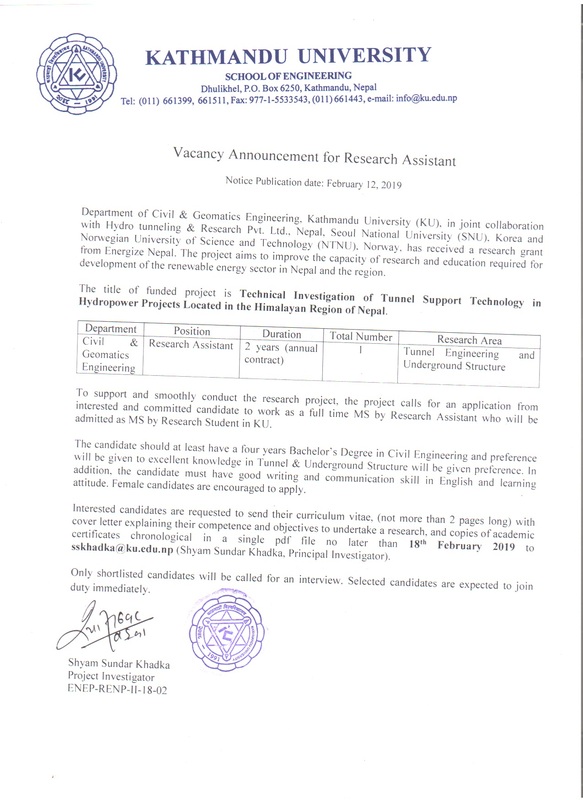 To support and smoothly conduct the research project, the project calls for an application from interested and committed candidate to work as a full time MS by Research Assistant who will be admitted as MS by Research Student in KU.